Our first day in Sumatra was mostly travelling, we flew out from Singapore to Indonesia, landing in Medan, Northern Sumatra. From here we arranged a car to take us the 4 hour journey to a village called Bukit Lawang which sits on the border of the Gunung Leuser National Park. There was once a orangutan rehabilitation and release center here which has made this part of the jungle a great place to see wild and semi wild orangutans. We arrived in the afternoon and dragged ourselves through the village, over some dodgy rope bridge that stretched across the Bahorok river and then up 200 steps to a hotel called ‘On The Rocks’. I say hotel, they have 7-8 almost luxurious tribal huts situated in gardens, perched high above the river and village, with stunning views of the jungle from our private balcony, complete with hammock. This place was amazing… the bar had a 300 degree view of the surrounding jungle and gardens with friendly backpackers and hosts for company. We spent the next day visiting the orangutan feeding station where they have a daily feeding for the semi wild orangutans, they feed them bananas to help when food is short, this is a very bland food for them with the idea they will forage for more tasty food and only rely on the rangers feeding when food is scarce. We were lucky enough for a mother with a 1yr old and 7yr old to come for the food and we soon found ourselves just couple of feet away from them. It was an amazing and indescribable experience to be so close to this amazing great ape. Later in the day we wandered round the village and in the late evening walked out of the village to find a bat cave. We arrived a little late as it was quite dark, most of the bats had fled but we still got to explore 3 huge underground caverns, this was akin to caving but with no sense of safety which added to the excitement, we saw some very loud bats and a scorpion! The next day we had arranged to go on a 2 day trek into the jungle so woke up bright and early to head out. 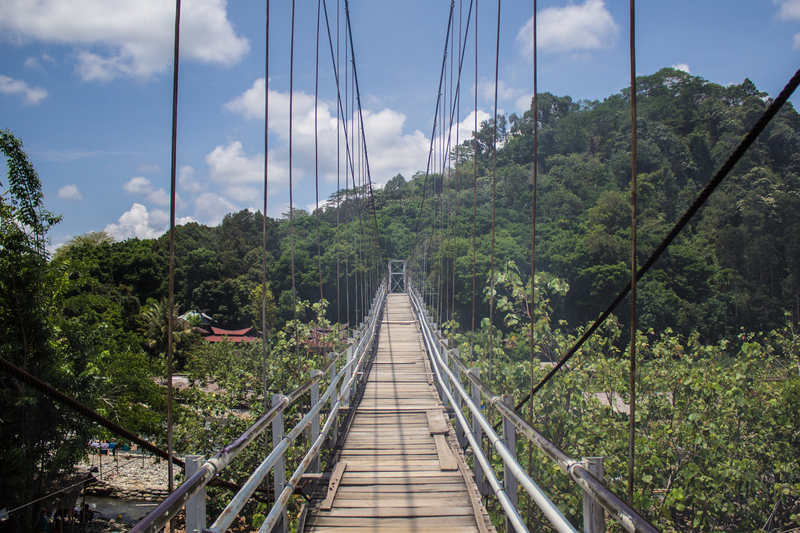 We travelled with 2 other couples, and 2 guides who were stopping all the time to show us the flora and fauna that surrounded us, encouraging to smell and taste everything the jungle had to offer. 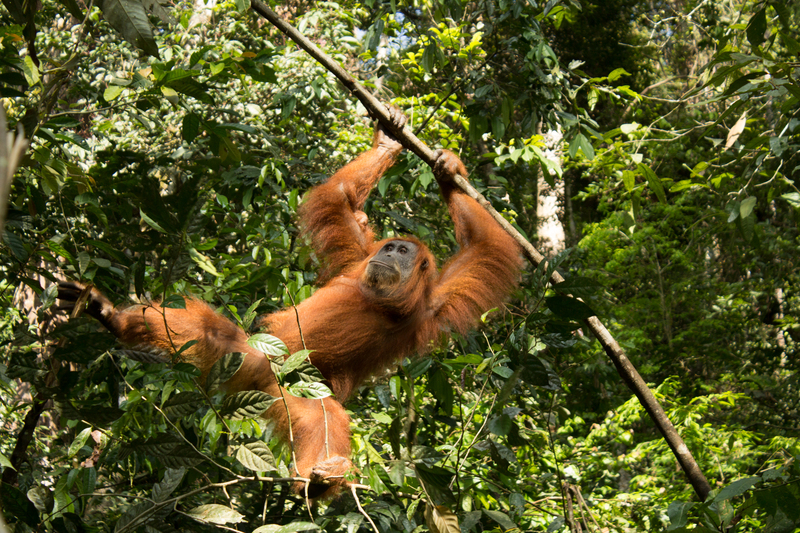 We soon came across an orangutan and infant where we stopped for a while to watch as they lazed around in the trees. We also got to see Thomas leaf monkeys, white handed gibbons and a few interesting insects including a praying mantis that landed on my foot. Sadly we had to cut the trek short as I had come down with a fever coupled with some rather unpleasant side effects of malaria tablets and after half a day trek myself and Lou headed back to our accommodation thanks to our 2nd guide ‘Alto’. The next 2 days we spent lazing around On The Rocks watching the monkeys swinging in the trees from our balcony as we both recovered, we shared our Hut with a few geckos including one huge gecko the size of my arm! and after our amazing stay here we decided to head out a bit further into the wild to a small village called Tangkahan in search of Sumatran elephants.